“I over prepared myself and did a lot of prayer and meditation,” she told Ryan Seacrest during an interview at the 57th annual Grammy Awards on Sunday. 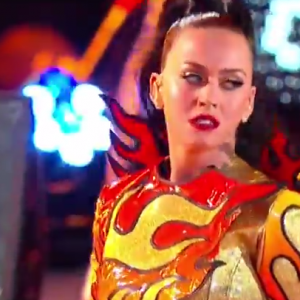 As previously reported, Perry performed several songs during the Super Bowl’s halftime show, including “Roar,” “California Gurls,” “Teenage Dream” and “Fireworks.” During “Roar,” the pop star rode a giant mechanical lion, and during “California Girls” and “Teenage Dream” she was accompanied by dancers dressed in shark costumes. In an interview with CCM (Contemporary Christian Music Magazine), she stated that one her musical influences was Keith Green, who was known to be bold in his lyrical witness for Christ. However, in 2007, Perry signed with with the secular label Capitol Records, and released her first single, “I Kissed a Girl,” which rose to the number one position on the secular pop charts. The popularity of Perry’s single brought continued national attention until she became one of the most well-known pop artists in the secular music industry. She later announced that she no longer professed to be a Christian. “I love my daughter and I will always love her. Stop being judgmental and critical,” he said in 2012, choking back tears. Earlier this month, Hudson attended the Super Bowl to watch his daughter, commenting to reporters that she was going to “do some good” songs, and that he is “always proud” of her. “I’m a proud father,” he said. On Sunday, Perry was among those in the audience who donned devil horns during AC/DC’s performance of “Highway to Hell.” She also made the devil horns symbol with both hands as cameras moved across her row.